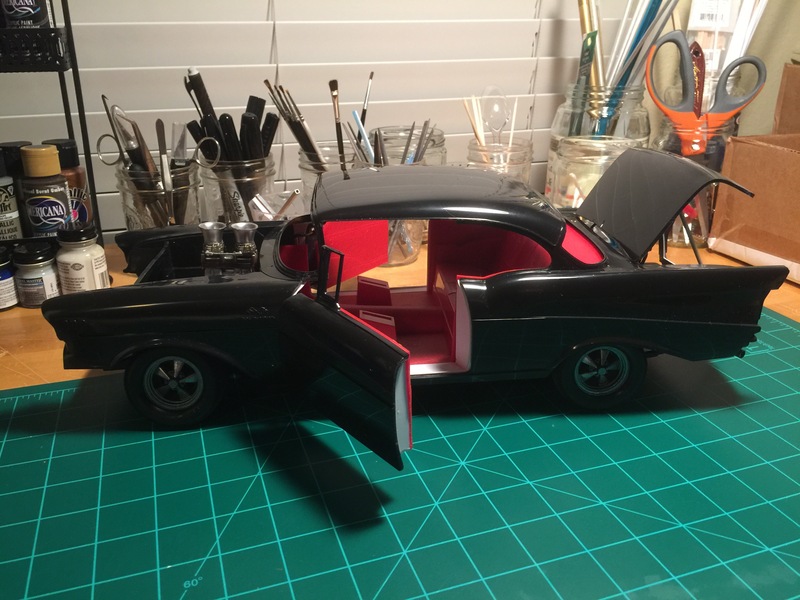 Here’s the progress on my 1/12 scale 57 Chevy street rod. This is the popular Monogram kit that I am customizing with opening doors and trunk. It was quite a job to scribe through the thick plastic of a model this scale! Hinges are fashioned from coat hanger wire and aluminum and styrene tubing. Styrene sheeting is used to create the door jams and rocker panels. More styrene will be used to replicate the 3D sheet metal nuances of a real car. This, my second kit after returning to model building, is a learn-as-you-go experiment! Thank God for all the modelers online! Here’s progress on the engine for my 1/12 scale 57 Chevy model.